A diabetes patient and good friend turned me on to these socks. Although they are not made specifically for diabetics, they have some interesting features that makes them unique and desirable. I have long been a fan of the Earth Therapeutics company, so when I was told it was them who made the socks, it was a definite positive factor. In other words, these look like socks that you would buy simply for the way they look, and not medicinal purposes. Somehow when you wear them, you don’t feel like they are meant for your foot health– they just look cool and different, and people will often ask where you got them. 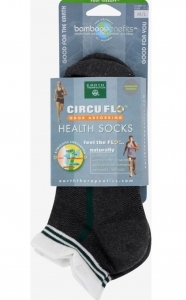 They have a non-resistant cuff, making them comfortable and appropriate for diabetic feet. The ventilated mesh weave is made from bamboo fabric, which supposedly works to reflect far infrared waves to improve circulation. If that sounds a little weird and hard to swallow, don’t worry, you’re not alone. My eyebrow went up too when I read that– but I was sold already with the look and feel of the sock, as well as its comfort. The bamboo weave is ventilated well, so your feet as less likely to get sweaty, and it helps to regulate the temperature year round. Bamboo is also supposed to be odor absorbing, anti bacterial and anti fungal. of the most comfortable socks I own. I love to wear them walking, because they keep my feet drier as well as more comfortable and well padded. As for the far infrared thing, well, I don’t really know how that works to be honest– but I can say that my circulation is excellent, and my feet feel great. These are definitely worth a look, especially if you have problem feet. I highly recommend them. In fact, I suspect most people would be pretty impressed with them.